MR. LINCOLN’S WHISKERS was featured prominently on an episode of Good Morning America’s American Snapshot called “Girl’s Letter Changes Face of Lincoln.” Watch the episode. Read a newspaper and think about the things you’ve read. Do you have some ideas about how to make things better? Now write a letter to a politician or someone in government with a suggestion. Write a letter to someone you admire and tell him or her why. During an election, write to your favorite candidate. Make a suggestion. Tell them why if you could you would vote for them. Who would you have wanted to be elected President in 1860? Pretend you are alive during the time leading up to the Civil War. Write your opinions and feelings. Even if Grace Bedell were grown up in 1860, she could not have voted. Women didn’t get the vote in the United States until 1920. What was the reason for that? Find out about what women did to try and get the power to vote. Look up “Suffragists”. Who were the most important ones? What difference has it made that women could vote? Download the School Curriculum Activities for Mr. Lincoln’s Whiskers. I’ve always been a fan of Abraham Lincoln and in some of the Lincoln books I’ve read there was mention of Grace and her letter—I wondered, who was Grace Bedell? I came to understand that though Lincoln was famous, he still possessed the humility to listen to the advice of a young girl. And Grace was too young to vote, but even if she were grown-up she couldn’t have voted. Women didn’t get to vote until 1920. So this was her way of saying that her opinion was important, too. These underlying messages made me want to write this story. My visit to Grace Bedell’s house in Westfield, New York. Lots of research was involved in writing this story. Finding out about Grace was like doing detective work, which makes historical research an interesting and fun process. 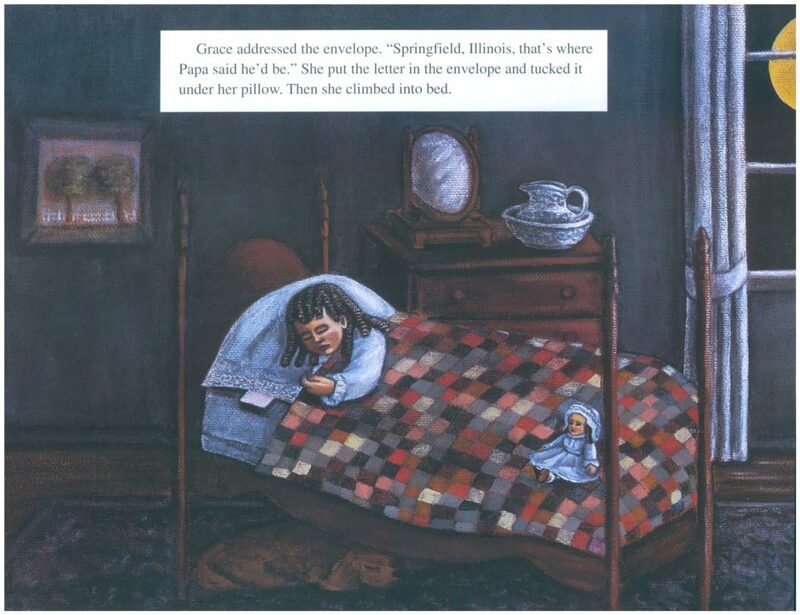 Through the scant information about Grace in Lincoln books, I learned that she lived in Westfield, a small town in upstate New York. I contacted the librarian who sent me copies of news clippings and other materials about Grace and her family. 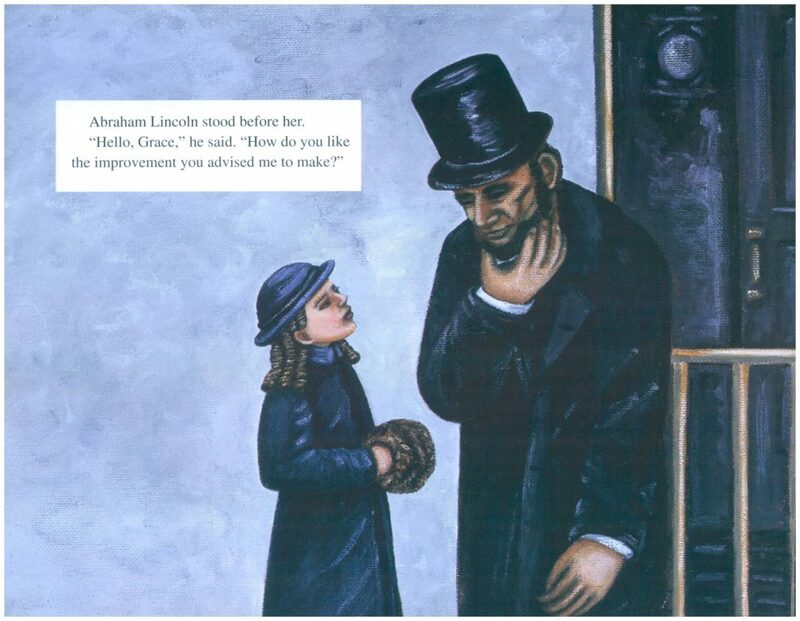 She also suggested a book on Grace’s life, Lincoln’s Little Girl by Fred Trump. At the time the book was out-of-print (it has since been reissued) but the librarian kindly loaned it to me, shipping it 3,000 miles across the country to Los Angeles! I researched more information through the Chautauqua Historical Society. (The town of Westfield is in Chautauqua County.) The Forbes Collection in New York City owned a letter that Grace wrote years after meeting Lincoln about her experience. I received a copy in which Grace mentions the postmaster, Mr. Mann. Also, I obtained a copy of Grace’s original letter from the Burton Historical Collection of the Detroit Public Library and a copy of Lincoln’s letter through the Gallery of History, dealers in historical documents. 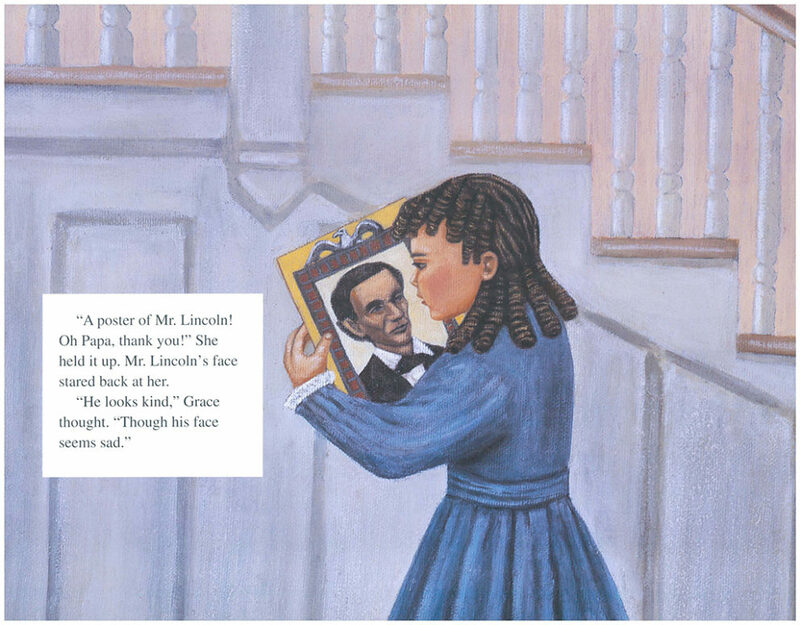 From newspaper clippings, I discovered something that made me want to recreate the story of Grace and Lincoln as a picture book. In his reply, Lincoln thanked Grace for her suggestion but didn’t say for sure he would grow whiskers. But I learned Lincoln took the train from Springfield, Illinois to Washington, D.C and on the way stopped at the Westfield station to show Grace he had taken her advice. Then I thought, now that’s a story! Abraham Lincoln was known as “Abe” Lincoln. Grace did not know how to spell Abe so she sounded it out and addressed her letter: Hon. (short for honorable) A. B. Lincoln. When Lincoln wrote back, he wrote “as to the whiskers, having never worn any, do you think people would call it a piece of silly affection.” Lincoln used the word “affection” which means caring. He actually meant to use the word “affectation” which means, “do you think I’d be showing off if I grew whiskers?” So even Presidents make mistakes! If you can believe it, the letter that Abraham Lincoln wrote to Grace sold for over a million dollars! The person who purchased it wishes to remain anonymous; he or she doesn’t want anyone to know who they are. During the election one newspaper wrote a verse making fun of Lincoln’s appearance. The last stanza read “…Any lie you tell we’ll swallow, tell us any mixture. But oh don’t for god sakes show his picture!” No wonder Grace was worried that Lincoln wouldn’t get enough votes if he didn’t grow whiskers! When he began to grow them, another newspaper wrote “Old Abe is…puttin’ on (h)airs!” I guess you can’t win! I was going to call my story “Mr. Lincoln’s Beard” but Grace and Lincoln both referred to facial hair as “whiskers.” Lincoln was the first President ever to have a full beard. 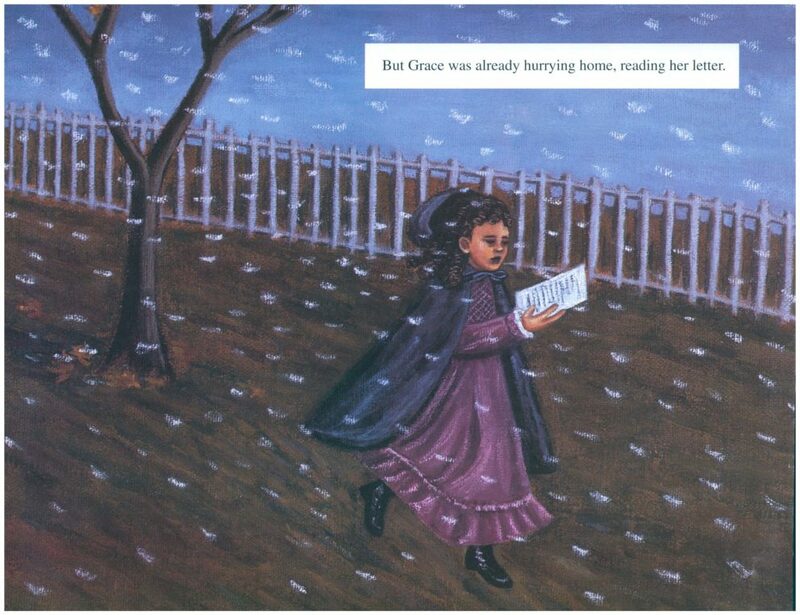 When Grace ran home from the post office reading her letter, light snow was falling. The letter got wet and the ink smudged. You can see the smudges on the letter reproduced on the endpapers and in the back of my book. The penny Grace used to buy the stamp to mail her letter cost a penny. But Abraham Lincoln hadn’t been elected President yet. The penny was one issued in 1859 and was called an “Indian Head” penny. The Lincoln penny was not issued until 1909 on the one hundredth anniversary of Lincoln’s birth. Lincoln was the first Republican candidate ever to win the election for President. The party had been formed in the previous election of 1856. In 1860 when Lincoln was running, there were four candidates. The Democratic Party split in two between Stephen Douglas representing the North and West and John Breckinridge, the candidate of the South who was pro-slavery. The Constitutional Union party nominated John Bell. A statue of Grace and one of Abraham Lincoln were erected in 1999 in Westfield, NY in what is now known as the Lincoln-Bedell Statue Park.